After more than 2 years in the making, Lars Petersen proudly presents ‘Feed Your Soul – Freestyle’. If you want to get into or improve your freestyle, then don’t miss these 135 outstanding minutes… Feed Your Soul’ is one of the most complete freestyle instructional films and offers top class instruction by the Danish windsurfer Lars Petersen. To ensure the highest level of instruction Lars teamed up with top British coach, Jem Hall. There’s a total of 113 of today’s most important manoeuvres, of which 55 are covered in depth. All you need to improve your freestyle sailing is right here! Free Your Mind Productions have travelled around the world and made high-octane action features on Gran Canaria, Bonaire, Maui, Rhodos and in Klitmøller. The film features some of the best freestylers in the world, which besides Lars Petersen includes 2 times world freestyle champion Ricardo Campello, Kevin Mevissen, Tonky & Taty Frans, Robbie Swift, Josh Stone and many more! 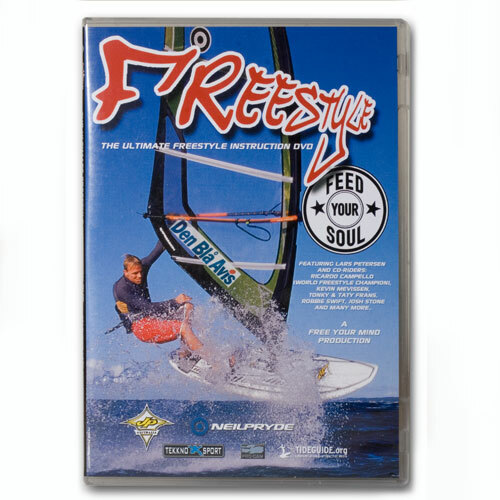 ‘Feed Your Soul – Freestyle’ is the first in a trilogy of instruction/action films, which when complete also will consist of a wave and freeride DVD. The aim is to fully cover each aspect of the sport, having the best action as well as the best instruction. Volcan / spock instruction 25:21 min.